1983: Scott Casey worked prodominantly for Joe Blanchard’s Southwest Championship Wrestling..
1980’s: Scott Casey briefly appeared in the World Wrestling Federation for a very short time..
Scott Casey is the older brother of Steve Casey (who wrestled as Steve Dane)..
Scott Casey lives in Las Vegas and is one of the trainers for the UWF promotion with Nick Bockwinkel..
Scott Casey worked security at the Luxor hotel/casino in Las Vegas..
June 13, 1987 – Superstars: The Dream Team (Dino Bravo & Greg Valentine) defeated Lanny Poffo & Scott Casey. June 21, 1987 – Wrestling Challenge: The Islanders (Haku & Tama) defeated Lanny Poffo & Scott Casey. July 18, 1987 – Superstars: Demolition defeated Scott Casey & Omar Atlas. July 19, 1987 – Wrestling Challenge: The Honky Tonk Man defeated Scott Casey. July 25, 1987 – Superstars: The Islanders (Haku & Tama) defeated Scott Casey & SD Jones. July 26, 1987 – Wrestling Challenge: Demolition defeated Steve Douglas & Scott Casey. August 16, 1987 – House Show: Bob Orton defeated Scott Casey. August 23, 1987 – Wrestling Challenge: Randy Savage defeated Scott Casey. August 29, 1987 – Superstars: Demolition defeated Scott Casey & Sivi Afi. September 12, 1987 – Boston Garden: S.D. Jones & Scott Casey defeated The Shadows..
September 13, 1987 – Wrestling Challenge: The Hart Foundation (Bret Hart, Danny Davis & Jim Neidhart) defeated Carl Schmidt, Scott Casey & Sivi Afi. September 19, 1987 – Superstars: The Islanders (Haku & Tama) defeated Lanny Poffo & Scott Casey. September 21, 1987 – MSG Network: Scott Casey defeated Steve Lombardi..
October 3, 1987 – Saturday Night Main Event: Scott Casey defeated Tiger Chung Lee in a dark match. October 3, 1987 – Superstars: Ted DiBiase defeated Scott Casey. October 4, 1987 – Wrestling Challenge: The Heenan Family (Hercules, King Harley Race & King Kong Bundy) defeated Brady Boone, Chris Curtis & Scott Casey. October 18, 1987 – Wrestling Challenge: Hercules & Rick Rude defeated Jim Evans & Scott Casey. October 31, 1987 – Superstars: Demolition defeated Brady Boone & Scott Casey. December 20, 1987 – Wrestling Challenge: The Honky Tonk Man defeated Scott Casey. January 9, 1988 – Superstars: Dino Bravo defeated Scott Casey. January 10, 1988 – Wrestling Challenge: Bam Bam Bigelow defeated Scott Casey. January 23, 1988 – Superstars: Hercules, King Harley Race & Rick Rude defeated Jerry Allen, Lanny Poffo & Scott Casey. January 25, 1988 – MSG Network: Scott Casey defeated Jose Estrada..
January 30, 1988 – Superstars: The Islanders (Haku & Tama) defeated Lanny Poffo & Scott Casey. January 31, 1988 – Wrestling Challenge: Greg Valentine defeated Scott Casey. February 28, 1988 – Wrestling Challenge: Scott Casey defeated Barry Horowitz in a dark match. March 5, 1988 – Superstars: Hercules, King Harley Race & Rick Rude defeated Scott Casey, SD Jones & Sonny Rogers. March 13, 1988 – Wrestling Challenge: Ron Bass defeated Scott Casey. March 19, 1988 – Superstars: Ted DiBiase defeated Scott Casey. April 3, 1988 – Wrestling Challenge: The Bolsheviks (Boris Zhukov & Nikolai Volkoff) defeated Allen Kinsey & Scott Casey. April 24, 1988 – Wrestling Challenge: The Islanders (Haku & Tama) defeated Scott Casey & Van Van Horne. April 30, 1988 – Superstars: WWE tag team champions Demolition defeated Scott Casey and Jose Luis Rivera to retain the titles. May 21, 1988 – Superstars: Rick Rude defeated Scott Casey. June 12, 1988 – Wrestling Challenge: Dino Bravo defeated Scott Casey. June 25, 1988 – MSG Network: The Big Bossman defeated Scott Casey. July 10, 1988 – Wrestling Challenge: The Bolsheviks (Boris Zhukov & Nikolai Volkoff) defeated Lanny Poffo & Scott Casey in dark match. July 23, 1988 – Superstars: The Hart Foundation (Bret Hart & Jim Neidhart) defeated Lanny Poffo & Scott Casey. July 31, 1988 – WrestlFest: The Big Bossman defeated Scott Casey. August 14, 1988 – Wrestling Challenge: Terry Taylor defeated Scott Casey. August 21, 1988 – Wrestling Challenge: Danny Davis defeated Scott Casey in a dark match. 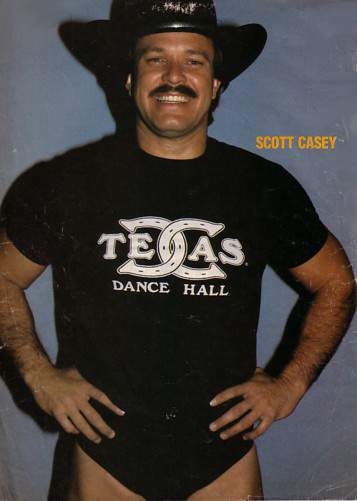 September 10, 1988 – House Show: Scott Casey defeated George Skaaland. September 29, 1988 – MSG Network: Scott Casey defeated Sandy Beach. October 2, 1988 – Wrestling Challenge: WWE tag team champions Demolition defeated Scott Casey and John Latu to retain the titles. October 29, 1988 – Superstars: Greg Valentine defeated Scott Casey. November 20, 1988 – Wrestling Challenge: Mr. Perfect defeated Scott Casey. November 24, 1988 – Survivor Series: Andre The Giant, Dino Bravo, Harley Race, Mr. Perfect & Rick Rude defeated Jake Roberts, Jim Duggan, Ken Patera, Scott Casey & Tito Santana in a tag team elimination match. December 10, 1988 – Superstars: The Red Rooster defeated Scott Casey. December 11, 1988 – Wrestling Challenge: Rick Rude defeated Scott Casey. December 18, 1988 – Wrestling Challenge: King Haku defeated Scott Casey. December 24, 1988 – Superstars: Rick Rude defeated Scott Casey. January 7, 1989 – Superstars: Ted DiBiase defeated Scott Casey. January 15, 1989 – Wrestling Challenge: The Brain Busters (Arn Anderson & Tully Blanchard) defeated George Terrell & Scott Casey. January 29, 1989 – Wrestling Challenge: Dino Bravo defeated Scott Casey. February 12, 1989 – Wrestling Challenge: Mr. Perfect defeated Scott Casey. March 5, 1989 – Wrestling Challenge: Hercules defeated Scott Casey. April 8, 1989 – Superstars: The Brain Busters (Arn Anderson & Tully Blanchard) defeated Omar Atlas & Scott Casey. April 16, 1989 – Wrestling Challenge: The Twin Towers (Akeem & The Big Boss Man) defeated Scott Casey & Stephan de Leon. July 21, 1989 – NWA The Great American Bash: Norman The Lunatic defeated Scott Casey. April 20, 1991 – Superstars: The Orient Express (Kato & Tanaka) defeated Rob Allen & Scott Casey. September 14, 1993 – Wrestling Around the World: Captain Of Husars defeated Scott Casey. After retiring from active wrestling, Scott Casey worked security at various casinos in Nevada..